Children learn music very differently to adults. I have been teaching guitar and studying teaching for close to 30 years. What I have found is children learn primarily by association. That is they associate some kind of meaning to learning music. If that association is positive they will most likely continue to pursue music their whole life. If it is negative they will probably give it away at the first opportunity. This means that its vitally important that we build positive associations to music early and yes I understand this is easier said than done. A parent's challenge is to a build this positive association to the experience of learning guitar. The good news is what matters most to children are their parents. Parents who work with their children especially in the first 6 to 12 months will generally have far greater success because this builds the positive association. Learning guitar = happy times with Mum and/or Dad. The benefits of working with your child go beyond just the ability to play guitar. In most cases your relationship with your child will grow and strengthen as a result. The secret is practice of course be this comes from parental support and guidance. If your child has recently begun lessons or seems to be losing motivation try sitting with them when they practice and help them work through the challenges. Leaving a young child to learn guitar by themselves is akin to giving a 3 year a book and telling them to teach themselves to read. 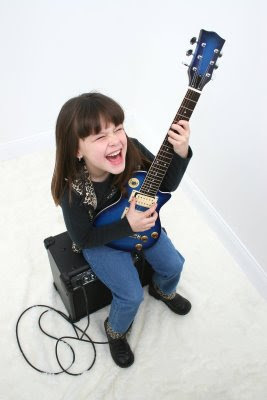 If you are interested in getting your child started on guitar please visit our website at; http://www.g4guitarmethod.com. The G4 GUITAR METHOD is a structured method of learning guitar. Its a unique system built on 29 years of research and experience based on a proven strategies. To view a video and learn more please visit our website at http://www.g4guitarmethod.com. If you are a parent check out the ParentalGuidanceInfo.com website. "When will I be able to play a song on guitar?" How do I get my child started learning music?